Backed with huge industry experience and market understanding, we are involved in manufacturing a wide variety of Wardrobe Corrugated Box. Clothing hangs neatly in box during the move.There is no wasted space in the box. It is easy to load and move. 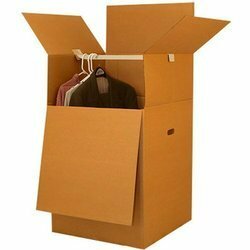 While engrossing on varied demands of many industries, we have been offering Wardrobe Corrugated Box that is used for varied purposes. Note:- Price may vary with size and quality. An excellent packing solution for shipping or storing clothes, these strong wardrobe boxes feature a plastic hanging bar and hand holes so they provide totally portable hanging clothes storage. If you want anything made from Corrugated board then give us an opportunity to do so. You can be sure that DGPL will work to produce the best products to suits your needs. Dhingra Graphics & Packaging Pvt. Ltd. Supplying & Fixing of wardrobe unit box. with Quality with bwr 18mm water proof plywoods. with inside Quality 0.8mm Laminat finish with Merino Lam or Green Lam Post Form Shutters finish. with Quality handles, And Auto inches and Quality Copboard Lock. and All door Outside single color finish. with 4' x 1½ ' Door Mirrors. Boxes with bars to store clothes in order. Keep your clothes clean and organised with this regular wardrobe box. Suitable for jackets trousers blazers shirts blouses and suits.